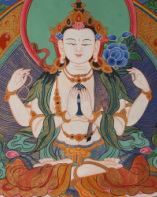 Deity yoga practices are scheduled on important days of the month according to the Tibetan lunar calendar, so always check our Monthly Calendar for specific practices and times. This page offers a brief introduction to Deity Yoga, as well as graphics and information on specific deities. For newer practitioners, who may find deity yoga mysterious, we hope this page can clarify any confusion. For more experienced practitioners, we hope it can offer new insights or information! What is deity yoga? The word “deity” itself can sometimes be confusing. 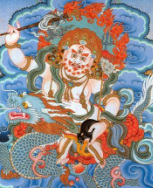 Within Vajrayana Buddhism “deity” does not mean “god”. It means a fully enlightened being. Deity yoga, then, is a practice which helps us identify with a particular fully enlightened being or Buddha in order to realize our innate Buddha nature. 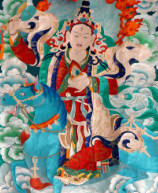 Using visualisation, chanting, mantra recitation, and meditation, we focus upon a particular deity and in many practices visualize ourselves as that deity, non-dual with them. We also visualize our surroundings as their mandala. 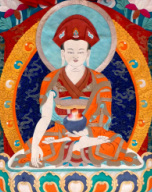 When we visualize the deity, it is important that we see them "as appearance that is inseparable from emptiness, like a rainbow or like a reflection in a mirror" (Kalu Rinpoche), not like a regular body of flesh and bone, nor like a statue. 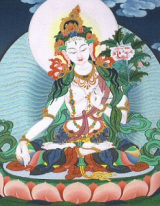 Thus, instead of conceiving of ourselves in an ordinary way, we visualize ourselves as the luminous form of Chenrezig, or Tara, etc.. On one level, visualizing in such a way helps us transform our ordinary self-image into that of the deity and thus cultivate their noble qualities in our own mindstream. On another level, it can give us the experience of nonduality. Deity yoga can thus help us transcend or abandon the fundamental delusion of separatness; the belief in an “I” and an "Other". 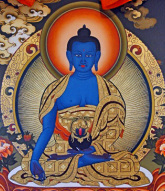 The deity mirrors to us our true enlightened nature. 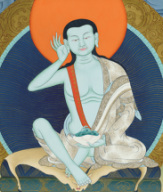 As our practice deepens, and we reach an ever closer identification/relationship with the deity, delusion and obscuration are revealed as illusory, and the energies of deluded mind transform into their non-dual, naturally enlightened qualities. 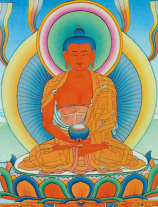 His Holiness the Dalai Lama has said, "In brief, the body of a Buddha is attained through meditating on it." Below are the deity yogas which we practice regularly at RigDzin Dharma Center. The practices on this list are open to everyone - from the first time visitor to the experienced practitioner. No previous experience or empowerments are necessary to participate in these practices. Click on the images to learn more about each deity.